On Monday, we went to North Bowl for a bowling tournament. We sucked at bowling, something fierce, but we did get to eat. 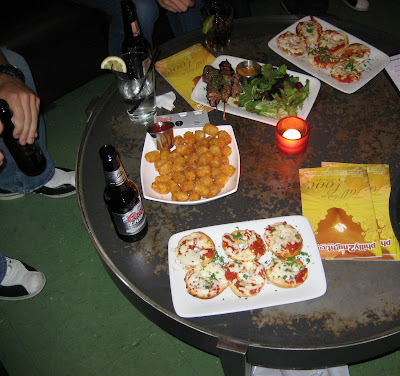 We got some appetizers – bagel bites, tater tots, thai beef sticks. The bagel bites were lovely. Little mini bagels toasted with tomato sauce and cheese. The sauce was sweet and zesty. The tater tots? Good, as usual. The beef sticks were really plain, a bit overcooked, but not bad with tons of the peanut sauce piled on it. Also, after we bowled(terribly), they did feed us some corn dogs and mac and cheese. The mac and cheese was alright. The corn dogs were mini corn dogs, but surprisingly filling. I love me some free corn dogs!